When it comes to couples costumes, I really like something that makes people smile. Of course, you can do scary costumes for Halloween but with a funny costume it breaks the ice at parties and people remember you and your costumes. If you are planning on going to a Halloween party or event with your spouse, significant other, sibling, or friend, you may be looking for couples costumes. The following Halloween costumes are an excellent choice as they are funny and come in a set of two so you don’t need to buy separate costumes. ⇒ Here are some hilarious costumes for couples that will not only make you smile, but make you the center of the party as a couple. Click here to see lots of fun ideas. This is a super fun costume that is perfect for any two people. It is not necessarily themed for a couple, so you can wear it with a friend, parent, child, or co-worker. It is an adult costume where one of you wear a bacon costume and the other wears an egg costume. Both costumes are soft and comfortable, being made of polyester. They need to be hand washed, so that is something to keep in mind. Both of the costumes are about 16 inches high and fit the average adult as a one-size-fits-all costume. These can also be used with teens. You and your significant other might also want to go with a cartoon theme, such as Mickey and Minnie Mouse. These could be couples costumes or you could use them separately for lots of different events or parties. This is a lighthearted set of Halloween costumes meant for teenagers or adults. It is suitable for people up to a height of 5’11”. The costumes are made from polypropylene cotton, velvet, polyester taffeta, and polyfoam. Each of the costumes comes with the body costume, head, shoes, and gloves, so this is really all you need to complete both costumes. The heads go entirely over your head, so no makeup is needed. To see the price, click the image. These are great couples costumes if you are looking for more of a humorous Halloween costume set for couples. For this costume you only get one when you order, so you’ll need to order two. Being unisex, you don’t need to order different costumes for him or her, you just order two of the same. This comes with two different costumes that can be worn by men or women as they are considered unisex. The costumes each make you look like a typical tourist, with a floral shirt and khaki shorts. The costumes are oversized (this gives them their fun look) with jumpsuits. These are one-size-fits-all, so should fit most adults. There are accessories, such as an inflatable oversized camera (this looks fantastic), sunglasses, straw hats, and toy binoculars. The accessories look great with the costume. I’d definitely get the inflatable camera and a straw hat to really add to the theme. For the price on this fun set, click the image. One of the top couple’s costumes on Amazon is the peanut butter and jelly set by FunWorld. This is another unisex costume set, so anyone can wear the Halloween costumes. One of them contains an oversized peanut butter bread slice as the costume, while the other one has a jelly bread slice. Both costumes are made from polyester and need to be hand washed. Each part of the peanut butter and jelly costume measures 14 inches wide and 1.99 inches high. For an excellent price on this set, click the image to see more. If you are looking at fun adult couples costumes, consider going as a wine and cheese set. This is another one-size-fits-all adult costume set, this time where one of you is the shape of a wine bottle and the other is shaped like a cheese platter with a large inflatable knife. 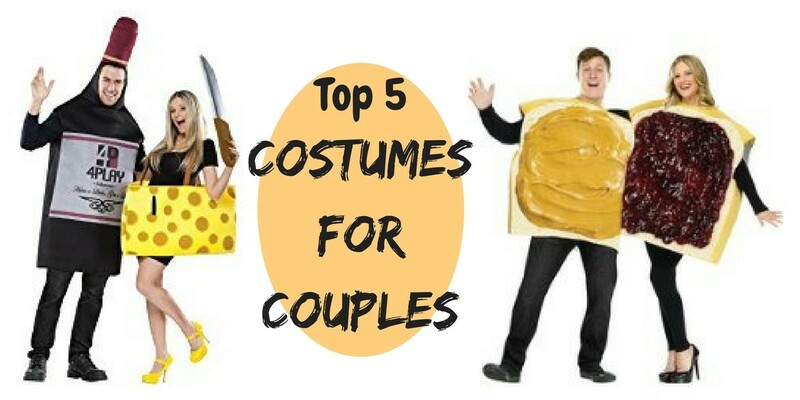 ⇒ Here are lots of costumes for couples that will make you smile. Click here to see all the costumes. ☑ Looking for family costumes? What about Beauty and the Beast? Click here to see more. This entry was posted in Costumes on September 21, 2017 by Cindy.